Fred Pegler, the son of Frank J. and Eleanor A. Pegler, was born at Painswick on his father’s seventy acre farm in 1881. However by 1891 his father had become a general labourer and the family had moved to 5 Yorke Terrace, Painswick Road, Upton St Leonards. Fred, who also worked as a labourer, joined the British Army in 1899 and served in the Boer War (1899-1902) with the 4th Battalion, Gloucestershire Regiment and in April 1900 he was posted to the island of St Helena to guard Boer prisoners; he was joined in this task by another Gloucester favourite, Harry Berry. During this period Fred’s army records show that he was 5’ 8½” tall, weighed 144 pounds (65 kilos) with grey eyes, dark brown hair and a ruddy complexion. Fred returned to Britain on 27 July 1901 and subsequently purchased his discharge from the army on 8 June 1904. Fred primarily now earned a living as a travelling brewer whilst living with his parents who had by now moved to 4 Sandylands, Highfield Road, Gloucester although he would soon become the licensee of the, now demolished, City Arms in Bell Lane. Fred joined the Gloucester rugby club on his return from St Helena and between 1902 and 1913, as a front row forward, played 239 games for the First XV scoring eighteen tries (fifty-four points) and thirty-two games for Gloucester A. He was appointed captain of Gloucester A for the 1910-11 season but his skills were in demand and he played the majority of that season’s games for the First XV. Fred was described as a reliable player who always “…rendered splendid service [and] worthily sustained [the Club’s] reputation” and although he was semi-retired by the 1912-13 season was “…always willing to lend a helping hand for the First or Second teams” He was a member of the 1905-06 Gloucester side which set up a new Club points record (661 points) with Fred playing in twenty-six of the thirty-seven matches. 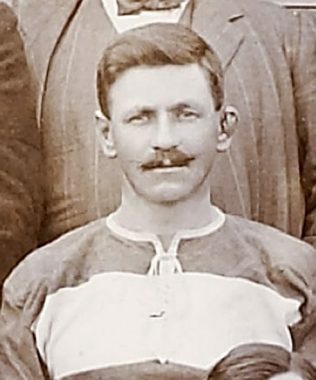 Fred was also a member of the Gloucester side which was decisively beaten by the All Blacks at Kingsholm by forty-four points to nil on 19 October 1905. He was part of a team which played Toulouse in February 1911 “…in order to give the French experience in what to them was a new sport.” The Gloucester party travelled for three days with overnight stops in London and Paris to reach Toulouse. Gloucester won the game played at the Stade Toulousain by 18 points to 13. With the outbreak of the Great War in 1914 Fred enlisted as an Able Bodied Seaman (J.17694) with the Royal Navy and was based at the Royal Naval Dockyards, Devonport, along with other club stalwarts including Arthur Hudson and Dave Holland. Although Fred had retired from first class rugby he did play for the Devonport Royal Naval XV, no doubt persuaded to do so by Arthur Hudson who organised the rugby matches; Arthur Hudson would arrange matches with any Royal Navy ships that were in port. In March 1917 the naval side played the first of several matches against Gloucester to raise funds for the Great Western Road Red Cross Hospital although this was not Fred’s first war time game at Kingsholm as he had played at Christmas 1916 in a game against Cinderford, raising funds for the local Red Cross which played a vital role in nursing wounded soldiers of all the Allied nationalities back to health. For his contribution during the Great War Fred was awarded the 1914-15 Star, the British War Medal and the Victory Medal. Three of Fred’s brothers served in the Great War, Alfred (Worcestershire Regiment and Royal Engineers), Ernest (Gloucestershire Regiment) and Harry (Worcestershire Regiment and Labour Corps); all three survived the war. In 1911 Fred had married Rose Mary Griffett and the couple had four children. Unfortunately Rose died in 1920 and Fred subsequently married Miriam Frances Jones and had a further four further children. One of his daughters, Violet, from his second marriage, was refused permission by the Gloucester Rugby Club committee during the 1948-49 season to form a Ladies Rugby Football Club. Apparently Violet’s enthusiasm for the game was derived from the fact that from the age of five years she had been taken by her father to watch Gloucester and as a consequence had played touch rugby in the British Army during the Second World War. Fred died on 14 October 1950 in Gloucester, aged 69 years, after being in failing health for a few years. The funeral was held at St Mary de Crypt Church.